Near Rumination on Northbridge Tournament. Moo! My first Regular time control tournament was played at Northbridge Baptist in Normal. It was a four round G/70 with 5 second delay. There were about thirty players total, and it really was enjoyable. Jeff Smith did a great job directing, as did Victor Mata (assistant TD and house player.) I arrived just in time to check in for Round 1. I consider it a very good game, and I was more or less on time with the other player. When I was finished it was great fun. eNotate is working very well. Round 2, and another loss against a local player I have known somewhat for some time. He’s rated 1484. I was playing White, led into a Giuoco Piano, and I think I got too cute by half. I kept ratcheting up pressure, giving him much of nothing. But I ended up having my Queen trapped, and it was a very quick loss thereafter. So now I’m in between rounds with 35 minutes to go before the next round. The playing facilities are very nice. The playing room is their main sanctuary space, and their multipurpose room is the skittles area. It is an enjoyable environment. There are many players here today (about 30.) Many of them I have known for over a year – I can count six that I know well, and another few that I know from the scholastic circuit. A lot of people are playing skittles games or analyzing their past games. I am not, myself. That’s a tradition that goes back to Speech & Debate in High School. During a S&D tournament, one can review the judge’s notes and try to adjust one’s performance in-tournament. But I never did…. Some of it is that I like the downtime away from the chessboard (and I feel like I’m playing enough chess today.) The other factor is that I don’t want to end up correcting my play, only to have that give me other weaknesses. I can always analyze my whole performance later. It may seem odd that I’m enjoying myself, with two losses so far. But the reality is that while I want to win, I remind myself of my primary goals in playing chess. Winning is not on to of that list. So, if that means I lose a game or games I still haven’t lost, if you follow. Thus I really am enjoying myself. Round 3 was another loss to an 1184 player. (Actually, the brother of the player in Round 2.) I had a few other things to accomplish, but I think I felt like I was stronger than this. It was still a very good game, we worked it down to the endgame and the other player had a Knight advantage. I think I was actually winning at one point. But three losses in a row – not good. Then in Round 4 I scored my first tournament win against an player rated 906. It was a Italian Game, Two Knights defense. I actually blundered by playing 4. Nc3 instead of 4. d3. 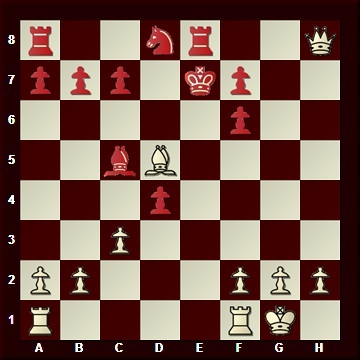 So the other player got to equalize by forking my Knight and Bishop with a pawn, but I recovered well. A few moves later I went up a Queen. But again, on move 17 I made a less-than-optimal play. I went straight out for 19. Rfe1+. Although I’m not hurting, the best response would have been 19. …Ne6 – breaking up the attack somewhat as then I’d have to shift my Queen. I was lucky – the other player played 19 …Kd7. That allowed me to continue my assault and go up a Rook. Mate came on move 25. I have to confess feeling a little sorry for my opponent. She was a 5th Grade girl who finished 0/4, and the only player with a 0 score. But she played well against me, and it was an honorable game. Also, in the chess world if you’re going to enter the kitchen of tournament play you take the heat. And I did feel good about my first tournament win ever, and don’t feel I have to apologize for that. Entries (RSS) and Comments (RSS). 25 queries. 0.669 seconds.